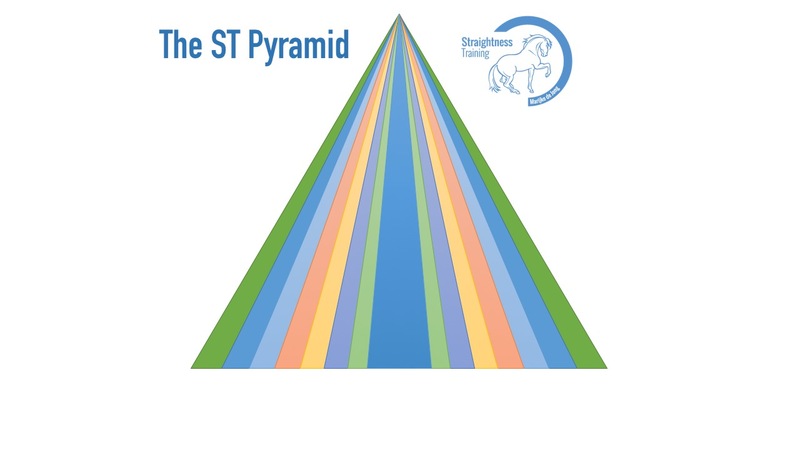 In Straightness Training (ST), we use the metaphor ‘ST Pyramid’ to explain that ST is not a linear process or a highway to success. Instead, it’s more a cyclical process. Just as life, ST, and its cycles can never be truly described as any part of a straight line. It’s more a series of ‘expeditions’ where you’ll be going up and down. It will be a journey, in which we will widen, broaden, and deepen our knowledge and skills in a cyclical way. 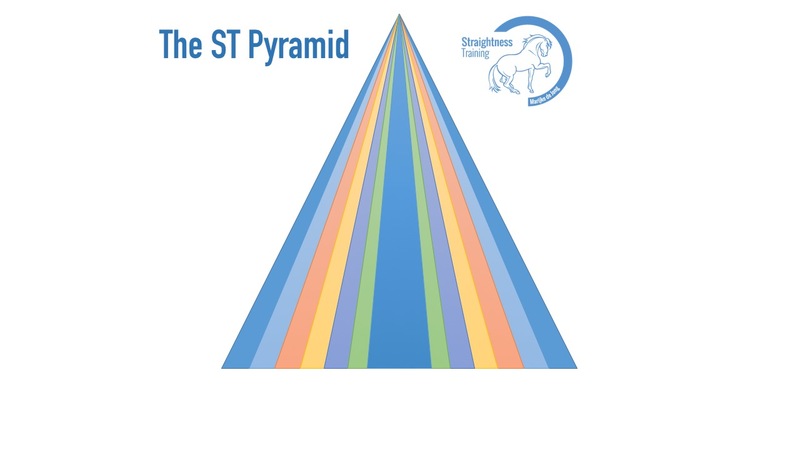 Now let me give you an example of how the ST Pyramid might work in practice. And to be clear: this is just an example! The order of expeditions is different. Or you’ll be doing other kinds of expeditions. Remember, the map is not the territory! 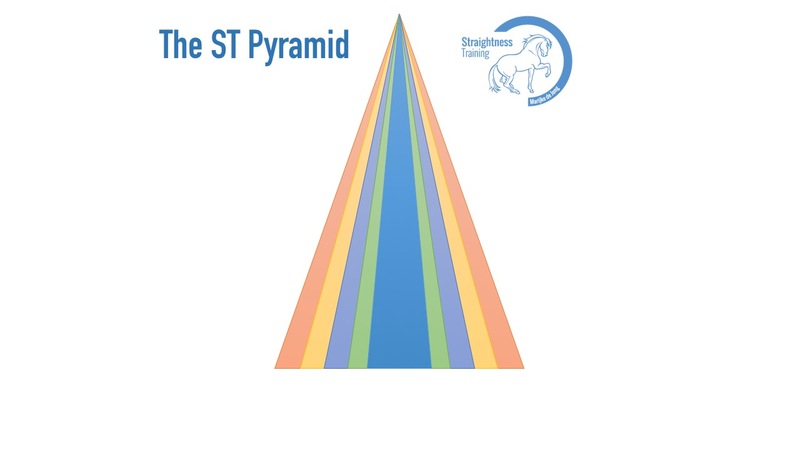 So this example is just to give you an idea of how the Pyramid concept might work in your laboratory. Before we start doing Straightness Training, starting at zero, we have to make sure we are able to apply our aids well, especially our rein aids. ⛔ Our horse goes in the opposite direction and into a state of flight. ⛔ Our horse goes against our pressure and gets into a state of fight. ⛔ Our horse ignores our pressure and gets into a state of freeze. We don’t want to end up in a push/pull contest or a nipping/biting game! 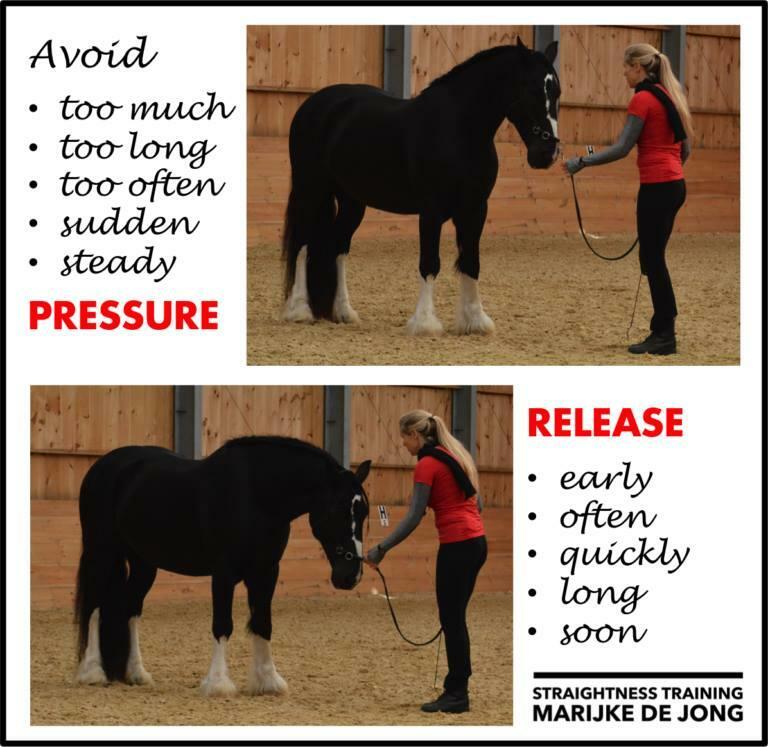 So timing & dosing of pressure is key #1! And the release is key #2: so we have to learn how to release early, often, quickly, long and soon! So a proper timing and dosing of pressure and release will be our starting point and base for ST. Besides the release, we need to learn how to time and dose our rewards and moments of relaxation. We also need to learn when to repeat desired behavior and how to redirect undesired behavior. In other words, you need to learn how to apply the 5R formula. Only with ‘Horse Training 101‘ in our pocket we can continue with one of the next expeditions. In most cases, when we start doing Straightness Training and passed expedition zero, we grow quite fast. So we start with the circle. Then we progress to shoulder-in. Then we take the next step and develop the haunches-in. After that, we start to experiment with the haunches-in on the diagonal, developing the half pass. And the haunches-in on the circle. Plus, the haunches-in through the corner, also called the renvers. But the pyramid is quite steep! Because we forgot to take the ‘essence‘ with us! Taking the essence with us on our next expedition is about integrating the LFS in all our work. The L makes sure we’ll have a proper lateral bend in the body. And F ensures a forward down tendency of the head and neck. 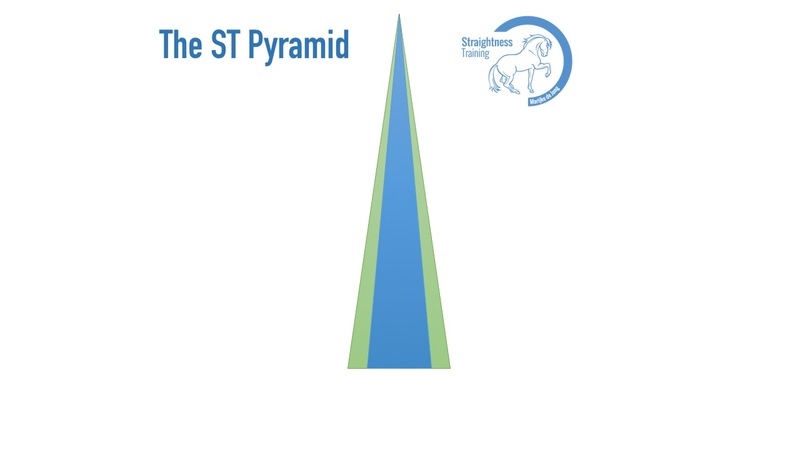 The S guarantees a supportive hind leg because it steps properly under the center of mass. And these three keys are closely connected – one cannot exist without the others, and the three keys must be taken with us as a unity; that’s why we use the term ‘LFS‘. So there we go, integrating the LFS in our work. So we might come to the conclusion that we forgot to take a proper tempo and rhythm on our way up. On our next expedition, towards the level of Grade 2, we start to add a normal tempo and a regular rhythm in all exercises. Balance – which means the center of mass is in the proper position, and the inside hind leg supports the correct positioned center of mass. Suppleness – which means our horse gives us the bend, and yields to the slightest half halts, and searches towards our hand. 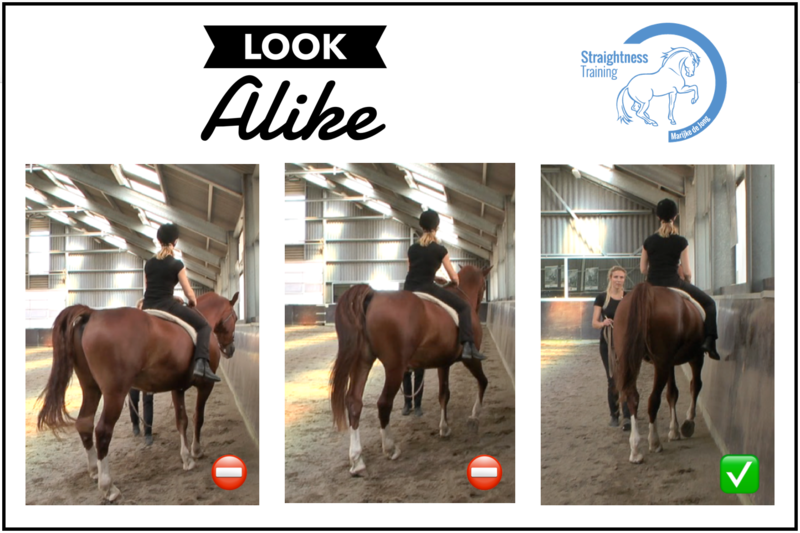 Shape – which means the right amount of neck bending, and the right amount of shoulders in or haunches in, so the horse doesn’t move sideways. Tempo – which means a normal tempo, instead of the slow-motion we apply in the teaching phase. Rhythm – which means regular steps with nicely forward swinging hind legs. 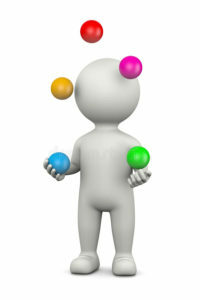 Now when going on our expedition, we try to keep these 5 balls in the air, like a juggler. So this expedition might take a little while. Sometimes it’s one step forward, two steps back. Because at times we lose a ball, or two, so we need to pick them up again. … to find out, we took a ‘cucumber‘ with us all the way up, and we should have taken a ‘tomato‘. So at the end of the previous expedition, we realized our horse had a bit too much ‘cucumber’ frame, which is a quite long frame. Now we all know that a tomato has a shorter and more round frame as a cucumber. Connection is about bringing the hind legs towards the center of mass. This way the energy that starts from behind, goes through the body, and arrives in front where are horse yields and searches towards our hand. 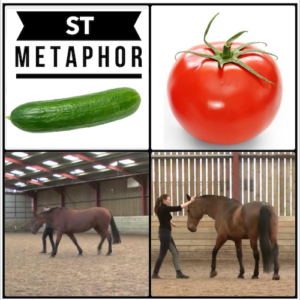 Now, when there’s a connection from behind towards the front, this leads to a round tomato shape, where the horse’s nose is close to the vertical. Then, arrived at the top of the pyramid, we have a nice physical connection in all exercises. But we realize that we forgot to ‘work’ on the mental connection with our horse as well. However, we want more than ‘just’ an obedient horse on the level of Grade 3. And the more our horse is a creative guesser, the more he’s in a figuring out state, the more he will build a bridge towards us. On our next expedition, we dive into the house of liberty (and for some of us we’ll have to start with this expedition, in case we don’t have a smooth working partnership with our horse at all). At liberty, we can find out if our horse not only understands what we want him to do, but that he also likes to figure out what we mean and is inspired and motivated to meet our requests. 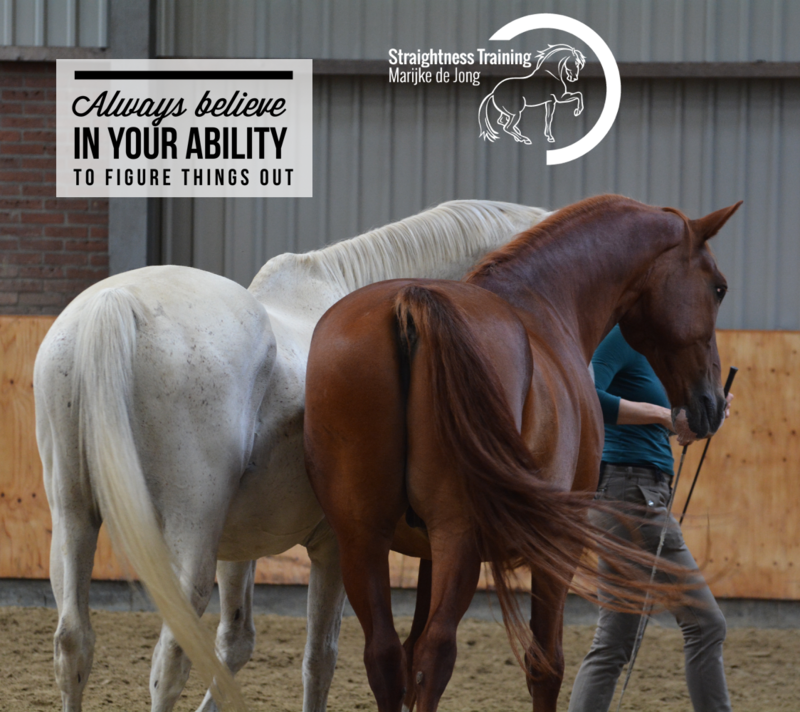 The more our horse is in a figuring out state, the more he will be a creative guesser, and in that state, he will easily offer us things in the learning and optimizing process. Now, at the end of this expedition, on the top of this pyriamid, we have some really solid basics when it comes to the physical and mental connection. But the basics are only basics if they are basics for something. And that ‘something’ is: collection. So on our next expedition, we are going to focus on collection in all exercises, which means self-carriage in body and mind. Now in connection, we brought the hind legs towards the correctly positioned center of mass. This time, in collection, we bring the center of mass towards the hind legs. 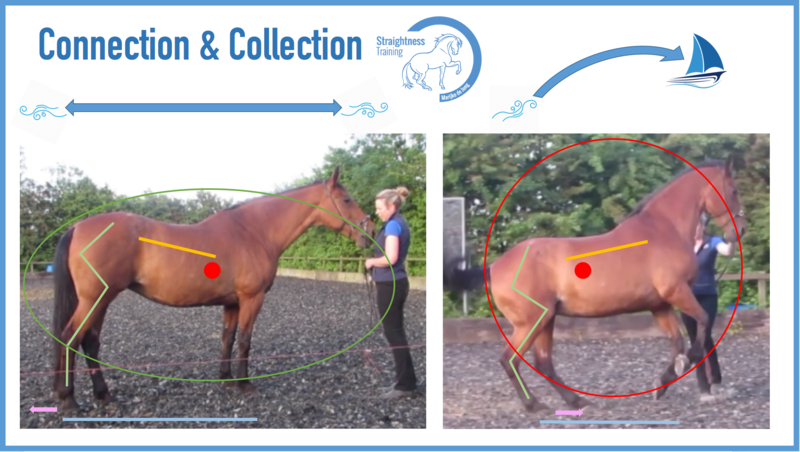 So it’s about shifting the weight more and more back, resulting in a tilt in the pelvis and a decrease in the joint angles in the hind legs. Collection, collection, and even more collection. So we lose the so-called “Steinbrecht forward” in our performance. So there’s a difference between moving ‘slow‘ and moving ‘collected‘. The tempo is low, and the rhythm is low. The hind legs push mainly backward, and the forward swing is reduced. The tempo is low, but the rhythm is high. The push backward is reduced, but the forward tendency is still there. “Ride your horse forward, and set it straight”. 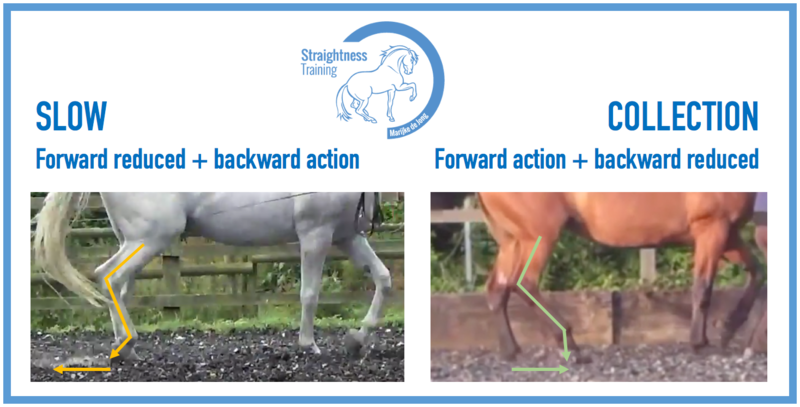 Realizing, that Steinbrecht’s ‘forward‘ doesn’t mean ‘fast’, but moving with all four legs moving in a forward direction, and keeping the hind legs stepping forward under the center of mass in an engaged way. But we might have forgotten to take care of our own mental or physical condition. This expedition is about self-mastery, and since this is a personal affair, it will be different or all of us. When we’re getting a little bit advanced, it’s easy to approach all we do with a Know-It-All attitude – then we need to empty our cup and restore our beginner’s mind. Or it’s the opposite, that we want to give up and quit after so many expeditions and plateaus. But maybe it’s the chasing more than one rabbits that’s holding us back. It could also be, that we make up stories in our head why we cannot have things – then we need to change our meaning and choose your thoughts to kill some Gremlins. Maybe we’re a bit hot-tempered, disagreeing too much with the world and criticizing others, therefore feeding the wrong stallion inside ourselves. Or we’re a bit too black or white in our opinions, forgetting that all the magic is in the grey and that the balance is in the green – then it’s probably time to leave the ‘blue’ level of consciousness. 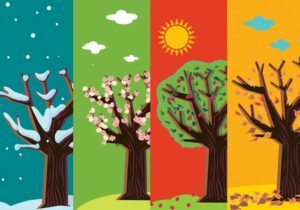 Maybe we forgot that important changes will not be caused by the BIG things, rather by tiny little details – so we need to embrace a bit more the CANI attitude. It is all part of freezing our pyramid below the sea level! It’s about freezing the ice. Widening, broadening, and deepening the iceberg. 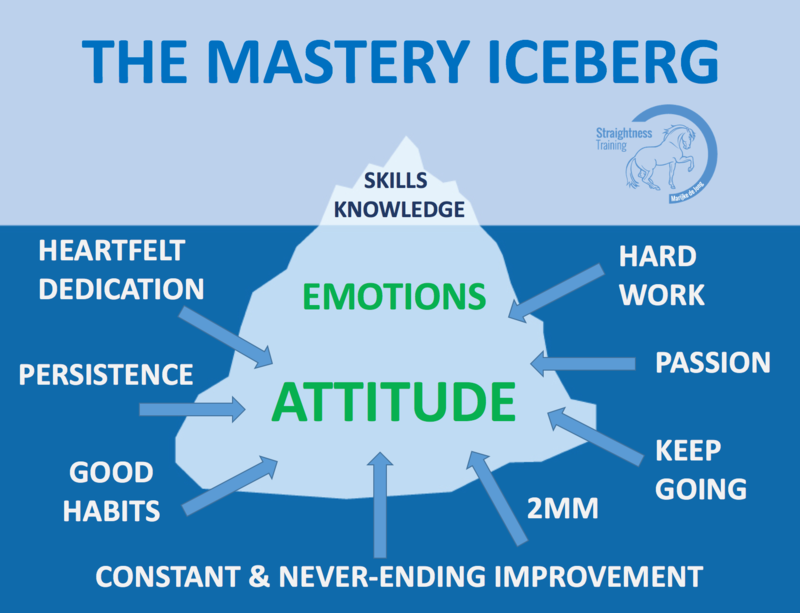 When we see an iceberg, all we see is the tip of the iceberg, which is 10%. But a lot is going on beneath the surface: 90%. What people see when they look at a master is his outstanding knowledge and amazing skills (10%). But what they don’t see is all the hard work he has put into it to get there (90%). 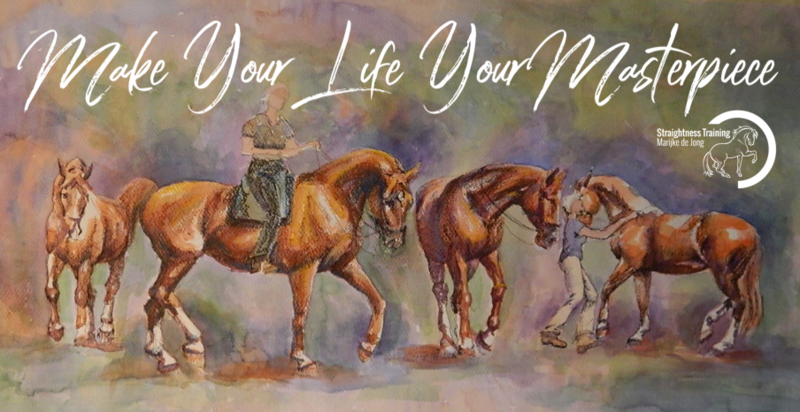 So when we see a master doing a piaffe or levade with his horse, we don’t see the many hours of training, years of schooling, numbers of expeditions, and many plateaus and setbacks. Thomas Edison ‘failed’ 10000 times before he invented the light bulb. Football player David Beckham practiced 50000 free kicks as a kid in the local park to be able to make the 61 goals that were visible to the whole world. Tennis champion Andre Agassi hit 1000000 balls a year so he could win 4x at Wimbledon, 8x Grand Slam and 1x at the Olympic Games. So it’s not an ‘inborn’ amazing talent they all have: their excellence is grown via effort and practice! So to become a true master, we have to be willing to freeze all the ice below the surface, so that we can shine above the surface. Therefore, true mastery is not only about a mental journey of gaining more knowledge and a physical journey of mastering all skills. 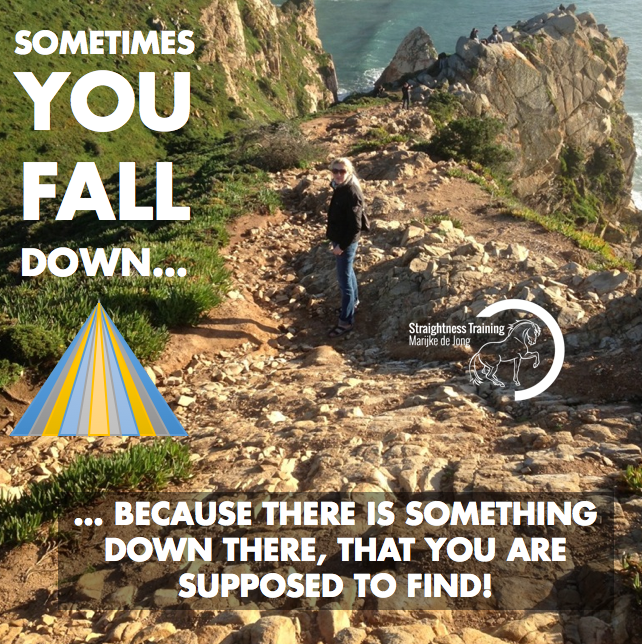 It’s an emotional journey where we learn to deal with setbacks, plateaus, failure, disappointment, and where we learn to keep going when other people stop and where we learn to stay in your balanced center with grounded, empowering emotions, no matter what. And it’s definitely a spiritual journey where we’ll embrace an empowering attitude to propel our abilities to greatness. 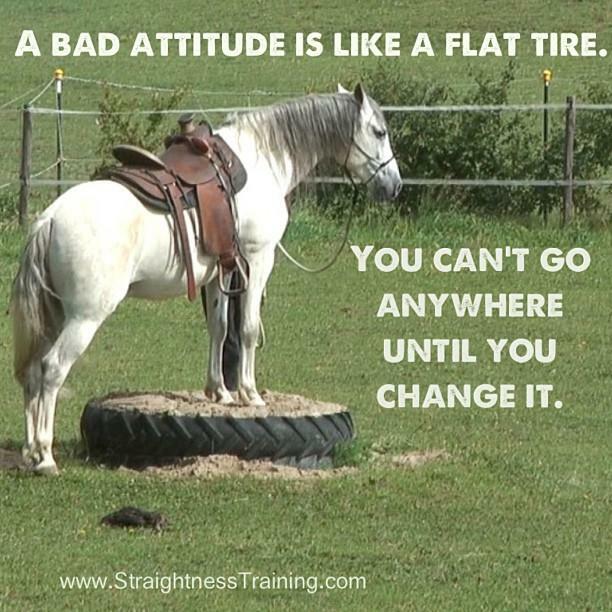 Because a bad attitude is like a flat tire: if we don’t change it, we’ll never go anywhere. In our next expedition, we’ll get more aware of our own “habit loops” which are our habitual patterns that are not always constructive. There is a deep hole in the sidewalk.I fall in. So, on this expedition, we realize “It’s always ME”. So when we’re busy working in our ST lab, we need to look carefully at what’s working and what’s not working. And when it’s not working, we should not blame the horse, or the method, or the tool, or the instructions, or whatever. Now at the beginning of our ST Journeys, it’s completely normal NOT to think it’s ME. If I am happy, it’s me. If I am unhappy, it’s me. If I make it, it’s me. If I don’t make it, it’s me. If I’m at the peak, it’s me. If I’m in the dumps, it’s me. If I join the mastermind sessions, it’s me. If I forget a masterind session, it’s me. If I use the free touchstones, it’s me. If I don’t use the free touchstones, it’s me. If I start to use paid touchstones, it’s me. If I don’t by touchstones, it’s me. If I train my mastery horse, it’s me. If I train a second horse, it’s me. If I don’t train because of the rain, it’s me. If I train in the snow or the desert, it’s me. If I win, it’s me. If I lose, it’s me. If I live, it’s me. If I die, it’s me. If we recognize “It’s always ME!” we’re ready for a breakthrough! Fix this one thing, and suddenly you see, there is a new sense of freedom in everything that you do! When we quit making excuses for our circumstances or whatever it is outside of our control, then we take ownership and avoid to use anything outside of us as an excuse. 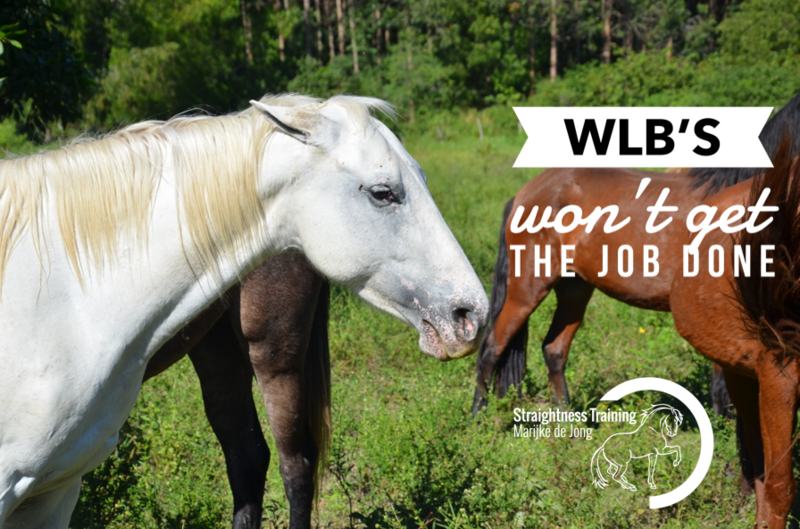 And remember: WLB’s won’t get the job done! Use the power of your ‘response-ability‘, your ability to respond. rather than complain about it. “Either you have ‘it’ or you don’t” – therefore, it’s outside of you. that we either have horsemanship skills, leadership competency, athletic powers, or whatever we need to train a horse, that we have ‘it’ or we don’t. that a great horseman has ‘it’, but we don’t. that we weren’t just born with ‘it’. We ALL are born with ‘it’! 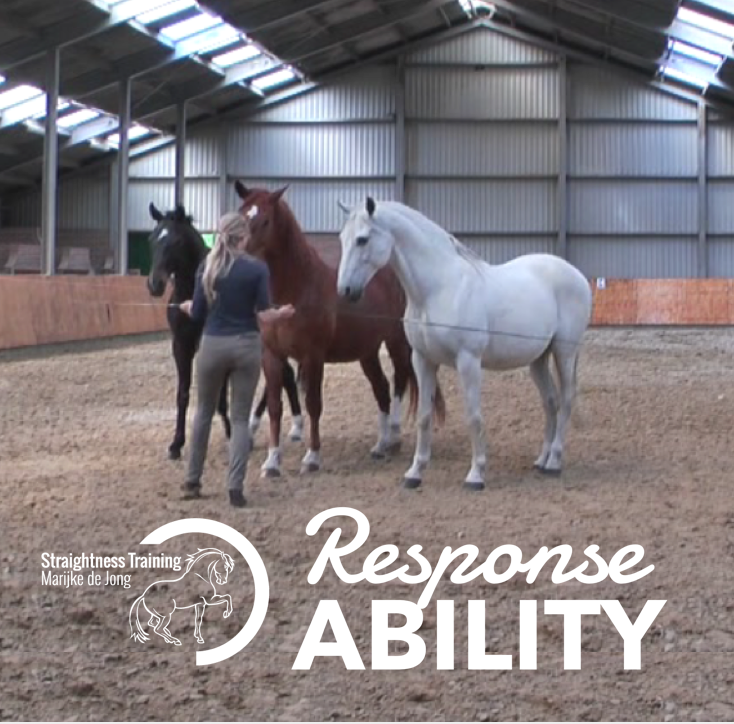 We all have the ability to adapt to a challenging situation with our horse. We all have the ability to change our approach to gain another outcome. We all have the ability to make a choice to act or not. Of course our actions are limited, but our responsibility is limitless. Resources are never usually the problem, our resourcefulness is almost always the problem. We can all do extraordinary things feel responsible and take responsibility, rather then finding excuses or blame anything around us. Miracles are reached every day in the world through people being resourceful and finding a way to make things happen when they seem impossible, rather than finding an excuse. The moment we realize this, we’re ready for the next expedition. We take the spiral staircase. Now all natural processes are cyclical and naturally repeating, rather than linear and not repeating. But our “thinking mind” doesn’t always want to accept this. Then we tend to look at ST through a linear filter, rather than approaching ST with cyclical awareness. Not immediately succeeding on any level is perceived as a failure. Trial and error are seen as natural, as letting go of old ideas and ‘going within’. Resistance to a downward turn – the only way is up. Acceptance of the fact that ST is an unavoidable mix of ease and difficulty – the one always turning into the other. Going down means ‘less’ or ‘loss’. The cycle’s true nature implies that ‘”This too shall pass“. Upswings can be made and develop in perfection by acting ‘correctly‘ and ‘doing all the right things’. There is Yin and Yang in each moment – both right and wrong are needed to progress. Alienating from nature by focusing on ‘production‘, and by ‘pulling the grass’ to ‘make’ it grow faster. Aligning with nature and ‘observing’ with curiosity how things arise and unfold while working with Mother Nature. When facing a setback, being terrified the sun will not return. When facing a plateau, being thankful for the ‘going within’ lessons that winter provides. So in linear thinking, we put energy into avoiding the unavoidable, not accepting that rises and declines come of their own accord and can rarely be diverted. 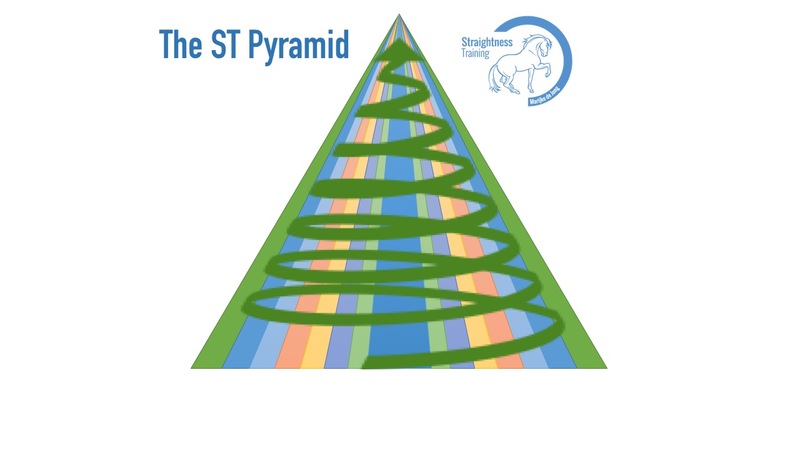 But the ST pyramid helps us to grow our cyclical awareness and to cooperate with the natural cycles. and going back to base and ‘going within’ when needed – releasing ineffective ideas and fruitless approaches – thus being better prepared and more adaptable when the next expedition starts. Because our pyramid is surviving all expeditions and all seasons so far, it becomes rock solid. So after widening and broadening our knowledge and skills, we can start to deepen it even more with 2 mm at a time. And not only that: storms make trees take deeper roots. So whatever challenges we face, our pyramid will get deeper rooted. When doing ST, the topline will automatically come if the horse is going properly through all expeditions. 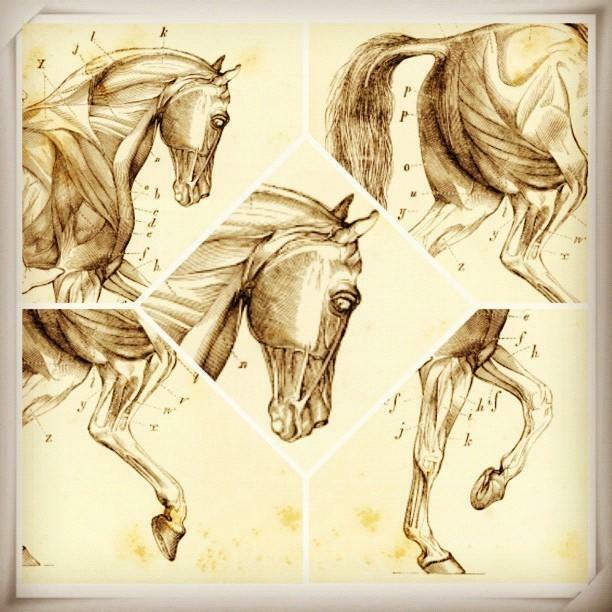 Only, by steadily polishing our work on the basic level (Grade 1), the elementary level (Grade 2) and the level of competence (Grade 3), we’ll arrive organically in Grade 4, the level of the Athletic horse and the Artistic performance (we call this AA quality in the Evaluation Program). Athletic horses have appropriate muscle mass to support their rider’s weight, perform the task at hand, and protect their joints and support soft tissues, such as tendons and ligaments. In Grade 4, the topline, which consists of all the muscles along the neck, withers, back, loin and hindquarters of the horse, should be rounded and strong. At this level, the athletic horse moves with relaxed activity and is able to coil his loin muscles, raise the base of his neck, and move freely and powerfully forward. But to get to this stage, we have to embrace the process of “Festina Lente“, which means “haste slowly“. Because we cannot pull the grass to have it grow faster, and we cannot ‘make’ the muscles to grow. Muscles will only arise organically by going through the logical system of progressive exercises, and by doing all the expeditions. 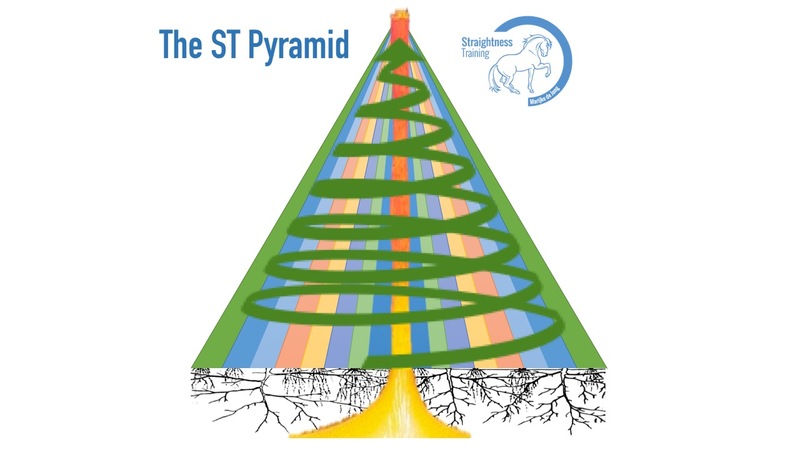 Only then, ST will take root, which becomes visible in an Athletic horse and an Artistic performance. From that well-founded and grounded level, we can add some inner, transformative fire. After an in-depth process of widening, broadening, and deepening, and after many expeditions, the horse becomes a true Powerhouse and we start to ‘own’ it. We start to understand everything deeply from the inside out because we gained so much experience. 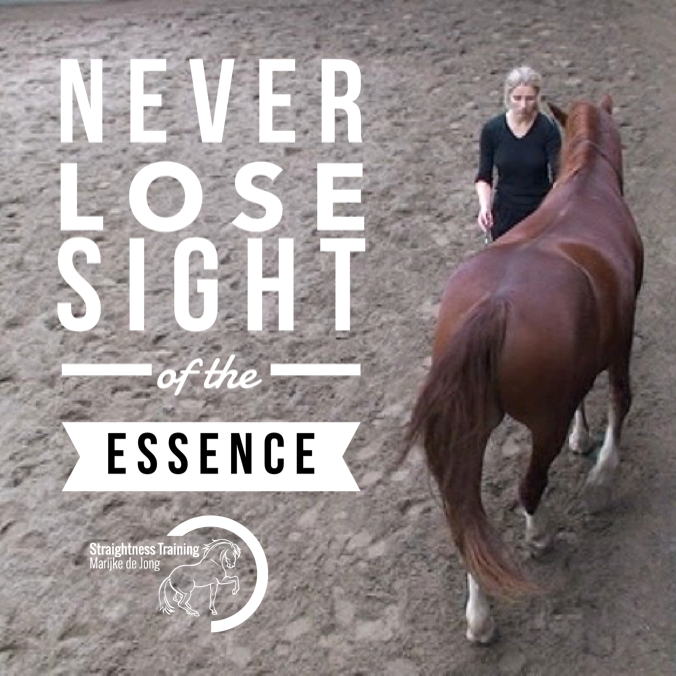 Especially, because we trained more horses than only one, since every horse requires that we see things from a slightly different angle and it “forces” us to come up with creative solutions. From our creativity, we’re able to combine all intellectual concepts with our intensely lived experiences and come up with completely new things. New ideas will erupt from our yellow level of consciousness and inner fire. And this inner fire is not burning because someone threw a match from the ‘outside in’, but because we have created unlimited fuel in ourselves from the ‘inside out’, with the help of all the horses we train. And with that, we can make a Masterpiece with our Master horse, which is a unique piece of art. 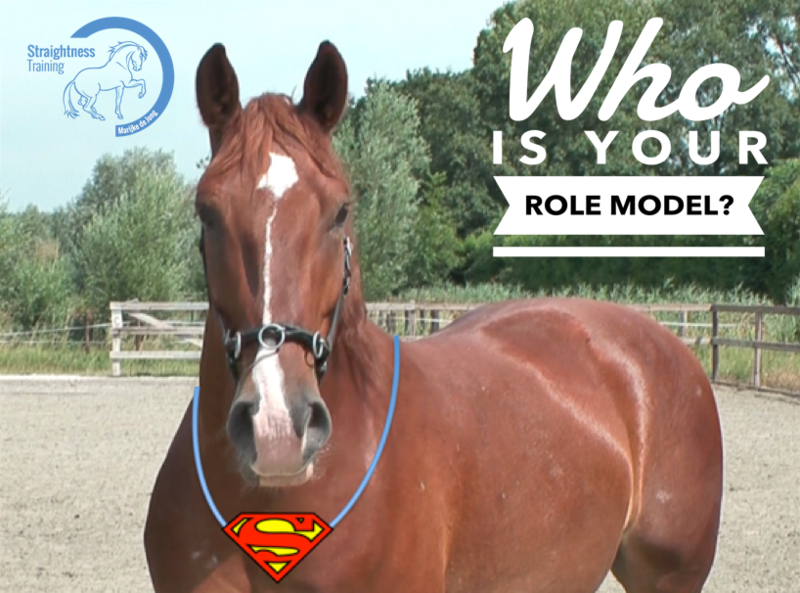 Where you’d like to share your yellow wisdom to make a positive difference for other people and horses. Where you want to serve as a beacon of light for others in need. So this inner fire might fuel your vision and mission. So here we are, and if you’ve made this far in this article, well done! That shows that you have good ice below the sea level! Now to wrap this article up, we can conclude that learning ST is not a linear process, but a cyclical one. And here’s one thing: everyone is going to experience this. And here’s another: everyone is going to underestimate this. Now the way I described the cyclical journey in this article will not exactly be your journey. But for sure it will be similar. That means it’s not going to be easy, but it’s definitely going to be worth it. But what to do when it’s not easy? For sure, we’ll hit a few plateaus and setbacks. Then we can do three things. That’s because there three types of students – let’s call them the ‘master‘, the ‘stressor‘, and the ‘dabbler‘. The stressor fights, and stresses, and wears himself out. The master says: “Ah, a plateau… to be expected”. Why would I quit over something to be expected? And why would I stress over something to be expected? Who’s been down this path before me? Who knows the way to the next step? Who can save me a month, a week, a day, by knowing the 1%, the 2mm? And he seeks them out! So feel free to seek help from my team of ST Instructors, the ST Evaluators, and me in the ST Academy. We’re here to help you find the missing 2mm! Showing you the next step! Helping you to break through. So you can save a week, a month, a year! Start Your First Expedition Today! If you’re ready for your first expedition, then join my free 4 part Mini Mastery Course! 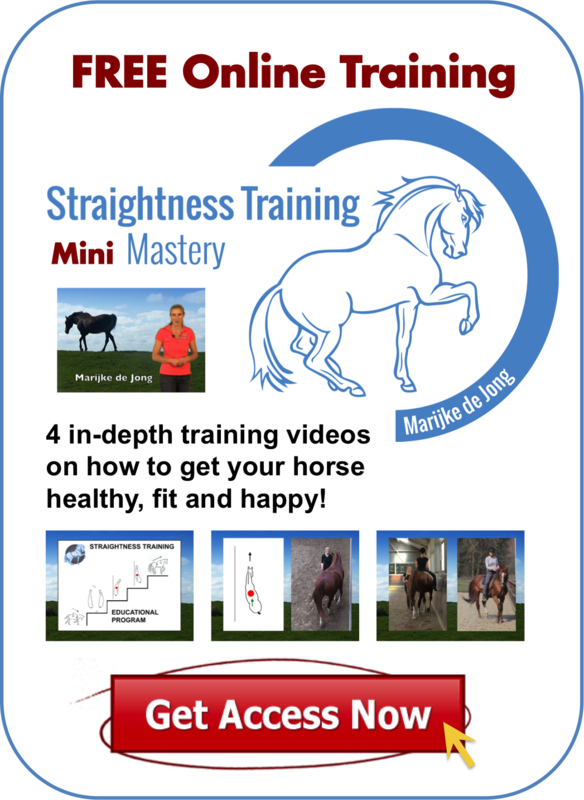 How to get your horse healthy and fit in body, mind, heart, and soul. Where to start, what to do next, and how to progress through a series of simple steps. How to teach your horse a new exercise in a horse-friendly way. Which training exercises most horse trainers fail to practice, and what you should do instead. 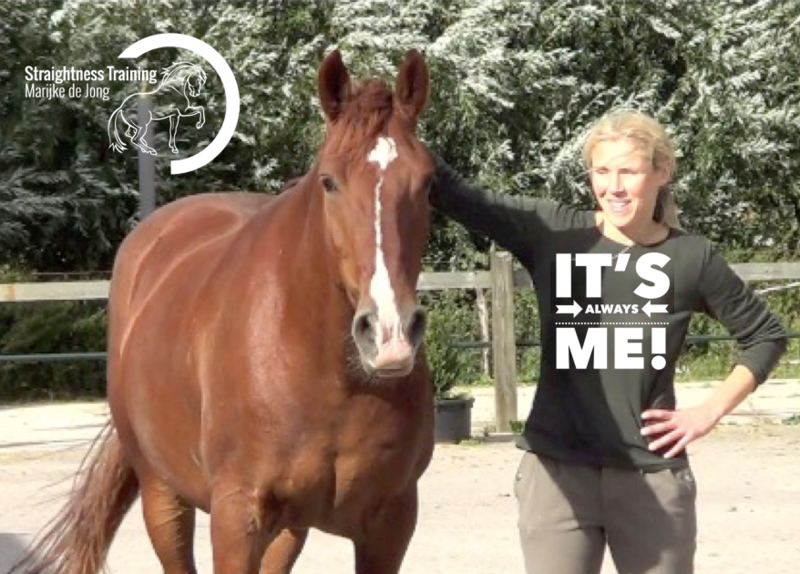 Six simple keys to make a positive change for your horse, no matter what discipline you’re in, and no matter what breed or age! All four video parts are accompanied by easy to understand theory and explanations, which makes it simple to follow and the processes even more clear! Plus, the downloadable manuals are very informative, useful and helpful. When I read this article it made me realise that all my effective learning that culminated in a raised skill level has taken place in this way. 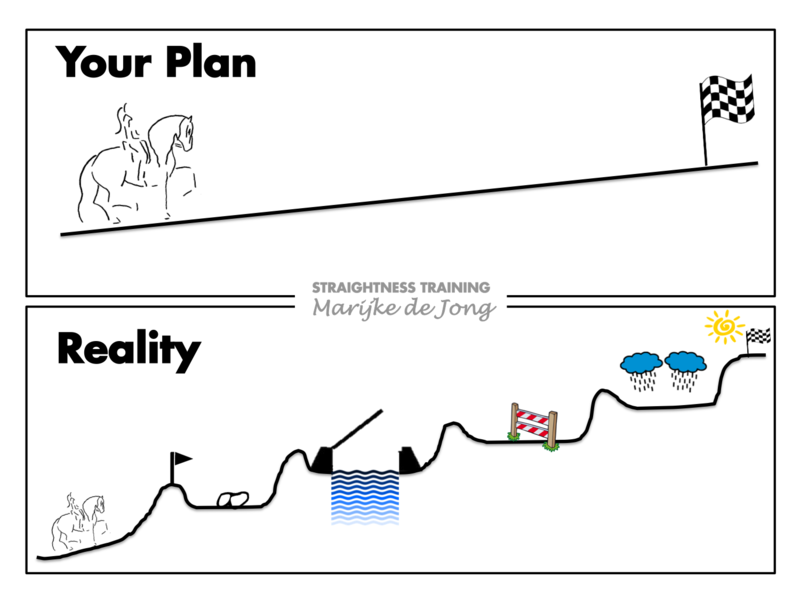 I think everything that Marijke is saying in the article resonates with me but it is very useful and encouraging to have it laid out especially when the dreaded plateau hits as this fills people with self doubt.